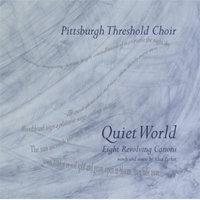 The Pittsburgh Threshold Choir's recording of Alice Parker's "Quiet World" is now available on CDBaby! Digital downloads of the entire album are $10 or you can order the physical CD for $12. Read more about "Quiet World" CD now available! Check out this beautiful documentary produced by the KQED Newsroom team. The story about Threshold Choir starts at about 20:55. It definitely gets the essence of what we do at bedside!